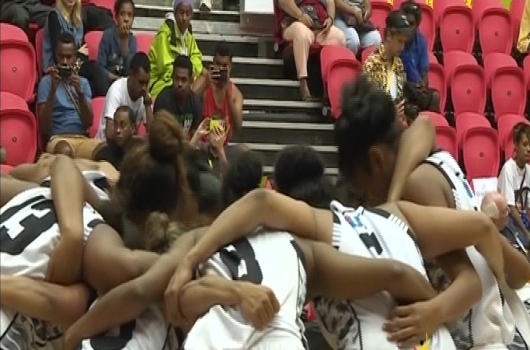 The Fiji women’s basketball side won gold at the Pacific Games in Papua New Guinea last night after defeating American Samoa 75-61 in the finals. The win capped off a remarkable competition for the side as Fiji finished unbeaten in the tournament. Meanwhile, the men’s side thumped hosts, PNG 82-52 in the semi-finals yesterday to progress to the finals against Guam at 5pm. It was sweet revenge for the national side, after their one-point loss to PNG in the round-robin stages. PNG will face Tahiti in the play-off for the bronze medal. In swimming, Cheyenne Rova won gold in the women’s 200 meters backstroke and Brooke Smith claimed the bronze while Rosemarie Rova and Tieri Erasito won a bronze and silver medal respectively in the 200 meters butterfly event. In the women’s 50 meters freestyle, Caroline Puamau claimed the silver medal while the women’s 4 by 100 meters medley relay team won the bronze medal. The Fiji women’s cricket side defeated Vanuatu by 12 runs yesterday to win the bronze. The final of the men’s Olympic qualifying soccer tournament between New Zealand and Fiji will be the headline act today. The winner of the match qualifies for the 2016 Rio Olympics in Brazil. The Fiji rugby league nines side continues its unbeaten form after beating Solomon Islands 16-0 and Tonga 8-4 yesterday. Today will be rugby league’s final day of competition with the gold medal play-off to kick-off at 6pm. Fiji and PNG have earned the favourites tag to feature in the final. The two sides meet in the preliminaries at 2:25pm before the semi-finals get underway at 3:40pm. In volleyball at 1pm, American Samoa meet Fiji in the men’s while the women face Tuvalu at 5pm. Looking at the medal tally, Fiji remains in fifth spot with 12 gold, 20 silver and 22 bronze. PNG leads with 34 gold, 24 silver and 19 bronze. Tahiti moves into second with 27 gold, 18 silver and 17 bronze. New Caledonia is in third with 26 gold, 25 silver and 24 bronze, followed by Samoa with 17 gold, 20 silver and 2 bronze medals.